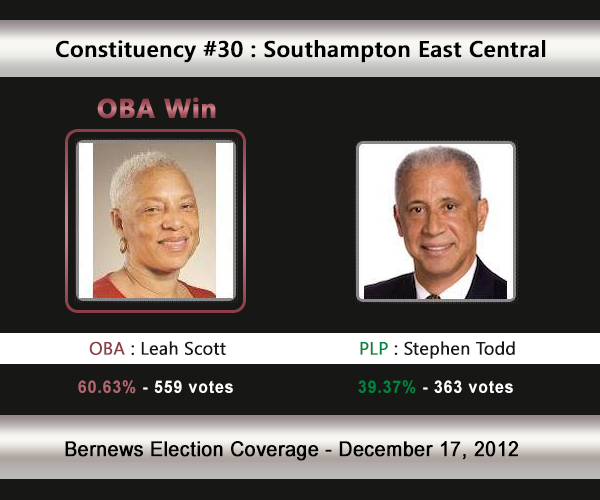 [UPDATE Dec 17: Election Results] Political newcomer Leah Scott [OBA] has defeated Stephen Todd [PLP] in C#30 Southampton East Central. The incumbent was Zane DeSilva [PLP], so the OBA pick up a seat. The voters of Southampton East Central will be selecting between the OBA’s Leah Scott and the PLP’s Stephen Todd in the upcoming election. The incumbent — the PLP’s Zane DeSilva — has moved to the Southampton East constituency. In 2007 Mr DeSilva won 52.2% [569-521] of the vote vs the UBP’s David Dodwell. In the 2003 General Election, Mr Dodwell won with 51.10% of the vote against Raymond Tannock [PLP] who received 48.90%. 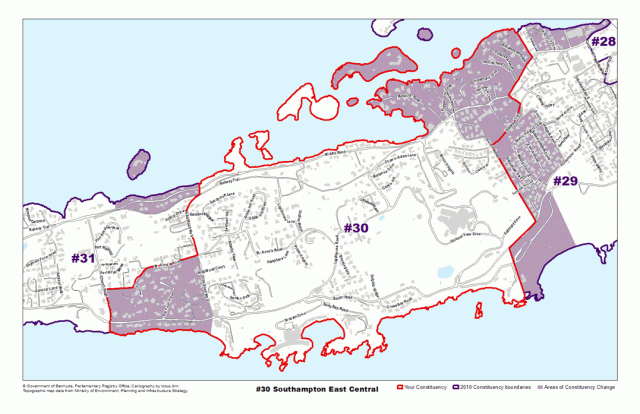 Areas the Southampton East Central constituency compromises of, or is located by, include the Railway Trail, Middle Road, Riviera Road, Scenic Heights Pass, Horseshoe Road, South Road, Tribe Road No. 3 and also includes Spectacle Island, Bartlett Islands, Five Star Island and Fish Hook Island. Mr. Stephen Todd, the PLP Candidate for the Progressive Labour Party, brings over thirty years of experience in Banking and Finance, and a sincere commitment to community service. A fourth generation born Bermudian, Mr. Todd is a firm supporter of the PLP – a party which has traditionally represented the interests of all Bermudians, and is committed to resolving challenging issues, through dignity and respect for all our citizens. As a PLP candidate, Mr. Todd believes that his primary responsibility is to listen to the ideas and concerns of his constituents. Mr. Todd’s decision to actively participate in Bermuda’s political interests is another avenue through which he can take an active role in serving our country. He believes that his years of experience in international business will be especially beneficial at this time, as government addresses the challenges that our country currently faces, as a result of the economic downturn. Listening to the concerns and ideas of his constituents is of significant importance because Mr. Todd wants to ensure that people’s concerns will be effectively represented and will thereby form the basis for positive action in their community. Mr. Todd was born in Paget. He attended Ord Road Primary School, and Churchill School. He was the President of the Bermuda Chamber of Commerce from 2009 – 2011. At present he is Vice-President of the Sandy’s Rotary Club. Like so many people, Leah Scott has been personally and professionally affected by many of the current issues plaguing our Island—the decline in international business, the challenges with the public education system, the continuously escalating national debt and the disintegration of the family unit. She is concerned about persistent inequalities facing women in every sphere of life, such as making less money and having greater family burdens than men, and she believes the One Bermuda Alliance can and will be the party to address these issues. Born to a pilot in the United States Air Forces posted to Kindley Field, Leah has lived her life both on and off Bermuda, but her heart has never left the island. After obtaining a Bachelor of Science degree from Morgan State University, she went on to earn a Post Graduate Diploma in Law from the college of Law of England and Wales. She was awarded her Legal Practicing Certificate in 2004 and was called to the Bermuda Bar the following year. Currently Leah is corporate secretary and legal counsel for Harbour International Trust Company Limited. A long-time community activist and sports enthusiast, Leah has served on the board of PRIDE, was membership secretary for Bermuda Tri-Hedz, as well as secretary for both the Bermuda Bicycle Association and the Bermuda Triathlon Association. She sits on the Executive of the Society of Trust and Estate Practitioners and is the Bermuda representative of the STEP Caribbean Conference Planning Committee. As director and secretary of the Sunshine League, Leah is able to embrace her passion for helping our island’s youth, promoting education and helping women to strike a balance between career and family. Leah attributes her drive to her mother, Ritchie. “We were smart, we were driven and we were always encouraged to do the best we could do, not just what was necessary.” It is with this spirit that Leah intends to represent the constituency of Southampton East Central.